There is nothing like summer.�Yes, it is hot and humid, but there is no pressure from school, no need to get after the kids to do their homework or prepare for that test.�Instead, we get to enjoy summer's slower pace, the ability to read a great book or tackle a new project.�We invite you and your family and friends to take advantage of this precious time by heading over to our "cool" library.�Our librarians have planned a wonderful array of programming for children, tweens, teens and adults.�Learn to fish or attract butterflies, enjoy the antics of Jiggleman or Geddy the Gecko!�You'll be happy you ventured over here and don't be surprised if you start spending more time at the library. 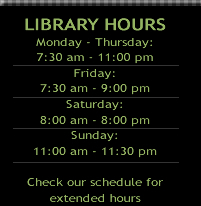 Did you know that the Alvin Sherman Library offers you access at no charge to many consumer publications? Check out Value Line or a host of fashion magazines like Harper's Bazaar or Vogue and even Vanity Fair. 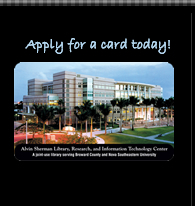 You'll need your Alvin Sherman Library or your Shark card to enter the site. Problems? Give one of our librarians a call and they can walk you through the process. 954-262-5477. Check out In the Spotlight for lots of fun and interesting information. Be creative with the Kid’s Crown Award Winning Shermanettes! 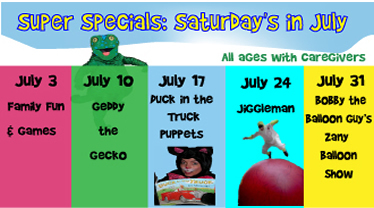 Every week we will explore the world of art, music, literature and puppetry with silly stories and songs. July 1 Silly Stories with The Shermanettes: Ocean Commotion! 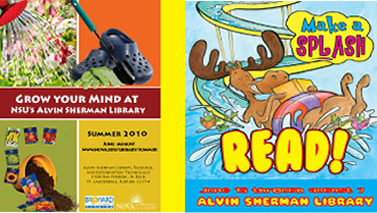 July 8 Silly Stories with The Shermanettes: Splish, Splash! July 15 Silly Stories with The Shermanettes: One Fish, Two Fish! July 22 Silly Stories with The Shermanettes: Surfing Safari! Do you know the difference between a ship and a boat? What do you call a boat with two hulls? How did sailors find their way before they had computer equipment to help them? 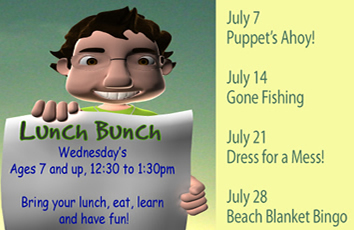 Learn fun facts, play games, and make nautical flags! 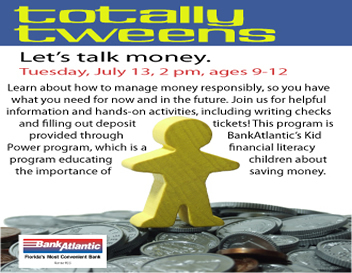 July 27- Totally Tweens: Sailing the High Seas, part 2 Join us as we explore the routes of some famous explorers, see ships throughout history, and more! We’ll meet in the computer lab for this week’s Internet-based activities. 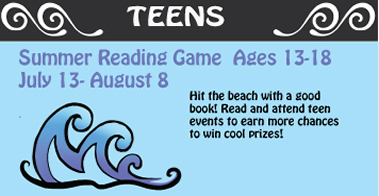 Last chance to become a teen volunteer this summer!! Visit The Teenroom for applications and instructions. Limited spaces are available. This month’s pick is The Hunger Games by Suzanne Collins. If you are a fan of the show Survivor, you must read this book! Transform old items into cool art creations! Go green and enter your creation for a chance to win! (contest deadline August 5). This month’s pick is Thirteen Little Blue Envelopes by Maureen Johnson. Teen Manga Club- Come discuss your favorite shōnen and shōjo with fellow Otaku (fans of manga)! Learn some simple photo editing tips and upload your finished pieces to the Flick'r photo sharing service. Registration for this program begins: June 23rd. Explore one of the top social networking tools on the planet. reconnect with old friends and discover new ones. Registration for this program begins: July 7th. Schedule a personal one to one overview with our librarian to discover the many tools available to help you create a successful resume. You'll also learn about the many electronic library resources.